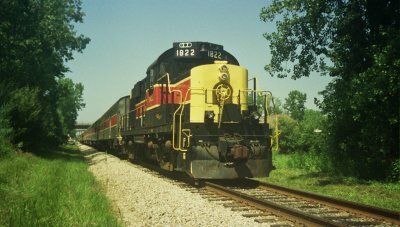 The Cuyahoga Valley Scenic Railroad operates between Independence and Akron and onto Canton in Ohio, through the Cuyahoga Valley National Park. The railroad follows the line of the Cuyahoga River and the historic Ohio and Erie Canalway as it meanders through the park. Further details can be found at the railroads own website www.cvsr.com . In summer 2005 Andy Read visited the railroad and some photographs from his visit are below. ALCO RS18U locomotive no. 1822 heads a service train on the Cuyahoga Valley Scenic Railroad. 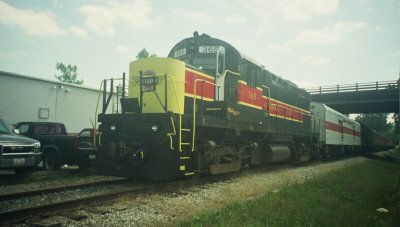 ALCO C420 locomotive no. 365 working a service train on the Cuyahoga Valley Scenic Railroad.